The first of six gates, a ‘V gate’, is at the trailhead. (The rest are all some variety of swinging gate.) After passing through the gate, Beardsley Trail descends to Morgan Wash on the Agua Fria River. Morgan Wash is filled with typical Arizona river bottom brush, but there is no threat of impromptu acupuncture, as Beardsley Trail is well cleared. That remains true all the way to Desert Tortoise Rd. The temperature is noticeably cooler in Morgan Wash, which is crossed by two wooden footbridges. (With a second gate in between.) On the west side of Morgan Wash, the Maricopa Trail — which is initially co-located with the Beardsley Trail — turns south while Beardsley turns north. After Morgan Wash, Beardsley Trail crosses the third gate, travels north on the siding of Old Lake Pleasand Rd. for 250 yds., then passes through the fourth gate on the west side of the road. After crossing Old Lake Pleasant Rd., Beardsley Trail is never more than a ¼ mile from pavement. The sound of heavy Carefree Highway traffic begins fading, being replaced by regular aircraft flybys. Beardsley Trail generally follows the contour line from spurs & washes running west off Lake Pleasant. Heading north, it is uphill (550 AEG), with two 170 ft. climbs. Heading back south to the Agua Fria Trailhead, Beardsley is generally downhill (300 AEG). The trail surface is not pristine, but it is still mostly rock-free. Beardsley would be awesome for trail running, or as a fast mountain bike track. 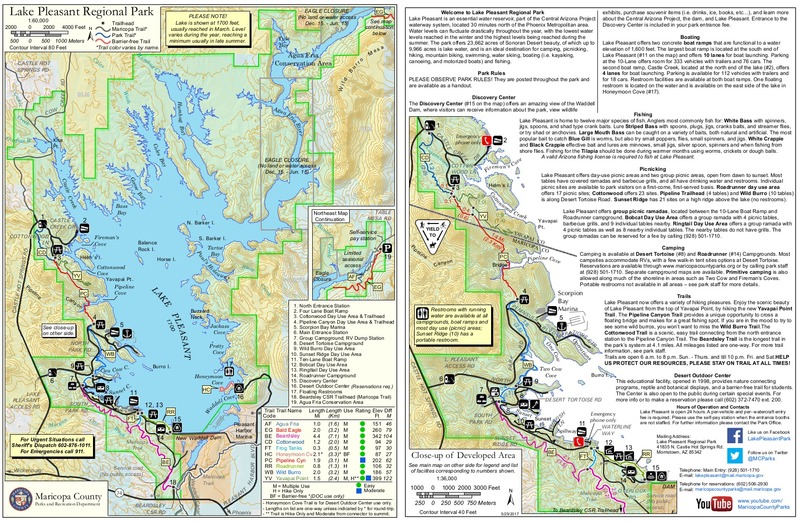 At 2.2 miles, Beardsley Trail crosses the fifth gate, then intersects Frog Tanks Trail, which runs 0.3 miles northeast to the Bobcat Day Use Area. From the fifth gate, it is 2.1 miles, a sixth gate, and a final road crossing, to Beardsley’s northern terminus on Desert Tortoise Rd. Beardsley Trail is good exercise on a great trail, but nothing really special without scenery, flowers or critters. But it does have far fewer people than Phoenix Mountains Preserve, so there is that. From Phoenix, head north on I-17. Take exit 223B onto Carefree Highway / AZ-74. Drive west for 9.1 miles. By Lake Pleasant, at the bottom of the hill, just after you cross the second bridge, turn right onto Beardsley CSR Rd. The Agua Fria Trailhead is 0.3 miles straight ahead, on the left.